Our work on quantum electrodynamics in 1D has contributed to the development of two new fields: microwave quantum optics (MQO) and waveguide quantum electrodynamics (wQED). The considerable body of work in these related fields is reviewed in recent Review of Modern Physics [R1] article on the subject. The work started with a set of experiments studying the strong coupling of a single artificial atom to an open transmission line. This produces an almost ideal 1D quantum electrodynamic system. Those first experiments demonstrated a number of interesting physical effects. For instance, we demonstrated that the coherent scattering of single photons from the atom leads to the strong extinction (>99%) of the transmitted light, an effect long predicted but never observed in conventional quantum optics [L14]. (This effect was first observed in the same year by Astafiev et al. at NEC.) In the same work, we demonstrated, for the first time, a rudimentary single-photon router in the microwave regime [L14], an important building block for future quantum networks. In the next experiment, we proved that the microwaves scattered from the artificial atom are definitively nonclassical [L16]. A key requirement of any quantum information network being the ability to generate nonclassical states of the electromagnetic field. We did this by demonstrating photon antibunching in the reflected signal, using a microwave photon statistics analyzer we developed . In a third experiment, we demonstrated a giant cross-Kerr effect orders of magnitude larger than in previous work [L20]. The cross-Kerr effect is an effective interaction between two photons mediated by the artificial atom. It has been widely studied theoretically because of a number of potential applications such as photonic quantum gates and quantum nondemolition (QND) measurements of photons. Working with theory collaborators, we have extensively studied the application of our artificial atom to QND measurements, showing they are feasible with existing technology [L18, L21]. More recently, we have studied the behavior of an artificial atom in front of a mirror. We found that the interaction of the atom and its own image strongly effects the strength of vacuum fluctuations seen by the atom. Under the right conditions, the atom could effectively hide from the vacuum [L22]. In our most recent work, we applied this effect to develop an on-demand source of single microwave photons with a “programable” wavepacket shape [A21]. Recently, we demonstrated a new regime of light-matter coupling strength, the ultrastrong coupling (USC) regime, that opens the door to new and novel physics as well as exciting new technological applications [L24]. (This work was completed in collaboration with Prof. Lupascu at UWaterloo.) Similar to the above experiments, we achieved this using a superconducting artificial atom tunably coupled to a 1D waveguide. However, we now demonstrated light–matter interaction over an order of magnitude stronger than previously reported anywhere, reaching the nonperturbative regime of ultrastrong coupling. For the largest coupling, the spontaneous emission rate of the atom exceeds its transition frequency. In this USC regime, the description of atom and light as distinct entities breaks down, and a new description in terms of hybrid states is required. Beyond light–matter interaction itself, the tunability of our system makes it a promising tool to study a number of important physical systems, such as the well-known spin-boson and Kondo models. In a follow-up work, we worked with theory collaborators to develop a greatly improved theoretical model of the system and studied the effect of intense driving on the USC qubit [L25]. Two parallel mirrors in empty space are attracted to each other due to the vacuum fluctuations of the electromagnetic field, which has a different mode structure inside compared to outside of the mirrors. This striking effect of quantum electrodynamics (QED) was first predicted by Casimir in 1948 and was only experimentally verified more than fifty years later. If instead the mirrors move, there is also a mismatch between vacuum modes at different instances of time. It was predicted 40 years ago that this may result in the creation of real photons out of vacuum fluctuations. This effect is called the dynamical Casimir effect (DCE). Working with theory collaborators, we showed theoretically for the 1st time that changing the electrical length of a transmission line by modulating the parametric inductance of a Josephson junction leads to the DCE [L10, A7]. In a series of experiments, we experimentally observed the DCE for the first time. In early experiments [L12, L8], we demonstrated that the nonadiabatic modulation of the electrical length of a microwave cavity, at ~10 GHz, leads to an effective photon-photon interaction that produced photons in the cavity. This was an important first step but, for a variety of reasons, it is difficult to demonstrate in a cavity that the source of the photon generation has a quantum origin. In the 2nd experiment [L15], the team addressed these difficulties by measuring photon generation in an open transmission line, conclusively demonstrating the quantum nature of the effect. An important part of this work was demonstrating that the DCE produces pairs of photons that are correlated, and important resource for quantum communication. Our work on the DCE was named by Physics World magazine as the Top 5 Breakthrough of 2011 and received the “Readers’ Choice” award from Nature News, as the most read article of 2011. The work was also heavily covered in the popular press, including a cover story in New Scientist magazine and popular coverage in The Financial Times of London, Le Monde, Forbes, The Hindu and numerous other magazines and newspapers. Prof. Wilson also received the 2012 Wallmark Prize from the Royal Swedish Academy of Sciences for the work. In the first experiment in the above series [L2], we further studied the dynamics of parametric oscillations associated with the photon generation. A driven parametric oscillator can exist in a number of qualitatively different dynamical states. We observed all of the states predicted by theory and demonstrated good quantitative agreement between the theoretical predicted and experimentally observed characteristics. We also observed switching of the oscillator between the various dynamical states. 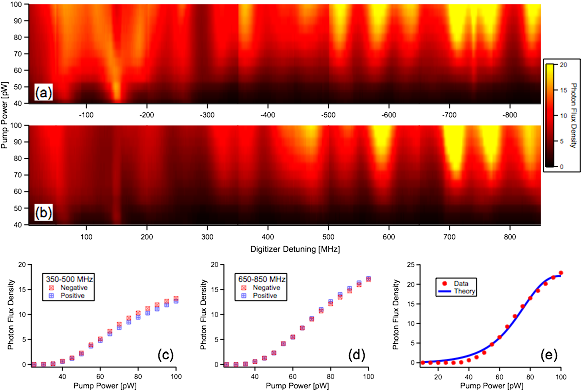 These results were an important verification of the general theory of strongly-driven nonlinear systems subject to noise. An enabling step in all of this work was the development of a new technology that continues to enable many fruitful applications in circuit QED (cQED) and elsewhere: tunable superconducting transmission-line resonators [L13]. Tunable resonators with the same architecture have been used by Dr.Wilson’s team and others to make quantum-limited parametric amplifiers and as coupling buses for superconducting qubits. Superconducting qubits are an important building block in the field of circuit QED. In early work, we studied the dressed states of a single-Cooper-pair box (SCB), a type of superconducting qubit, and an intense microwave (~ 7 GHz) field. The dressed states represent the hybridization of the qubit and photon degrees of freedom, and appear as avoided level crossings (ALC) in the combined qubit-photon energy diagram. The ALC occur when the energy of the photons is resonant with the charging energy of the SCB. By embedding the circuit in an rf oscillator (~650 MHz), we can directly probe the dressed states. On resonance, we see that the dressed states absorb energy from the oscillator. When the dressed states are off resonance, we see the dispersive shift of the oscillator frequency. We quantitatively explained both these effects in terms of the Bloch (NMR-like) response of the dressed states driven by the rf probe, allowing us to extract the relaxation and dephasing times of the states. This work was published in L9: PRL 2007. Working closely with the Chalmers theory group, we extended this work to include a microscopic model of relaxation and dephasing in the strongly driven system. Basically, the drive not only dresses the states of the system, but also dresses relaxation and dephasing [A6]. There has been a great deal of theoretical effort to understand this problem, but very little experimental data to compare and contrast with the various theories. We have developed a microscopic model, based on dressed states, that affords a straightforward physical understanding of the complex dynamics of the system. Further, we have demonstrated a good quantitative agreement between our theory and experiments. R1: “Strongly interacting photons in one-dimensional continuum,” D. Roy, C.M. Wilson, O. Firstenberg, Review of Modern Physics 89, 021001 (2017). L25: “Probing the strongly driven spin-boson model in a superconducting quantum circuit”, L Magazzù*, P Forn-Díaz*, R Belyansky, J-L Orgiazzi*, MA Yurtalan, MR Otto, A Lupascu, CM Wilson, M Grifoni, Nature Communications 9, 1403 (2018). L24:“Ultrastrong coupling of a single artificial atom to an electromagnetic continuum,” P. Forn-Díaz*, J. J. García-Ripoll, B. Peropadre*, M. A. Yurtalan, J.-L. Orgiazzi, R. Belyansky, C. M. Wilson, A. Lupascu, Nature Physics 13, 39-43 (2017). L23: “Single-shot read-out of a superconducting qubit using a Josephson parametric oscillator,” P. Krantz, A. Bengtsson, M. Simoen, S. Gustavsson, V. Shumeiko, W.D. Oliver, C.M. Wilson, P. Delsing, J. Bylander, Nature Communications 7, 11417 (2016). L22: “Probing the quantum vacuum with an artificial atom in front of a mirror”, I-C Hoi, A.F. Kockum, L. Tornberg**, A. Pourkabirian, G. Johansson, P. Delsing, C.M. Wilson, Nature Physics 11, 1045 (2015). L21: “Quantum Nondemolition Detection of a Propagating Microwave Photon”, Sankar R. Sathyamoorthy, L. Tornberg**, Anton F. Kockum, Ben Q. Baragiola, Joshua Combes**, C.M. Wilson, Thomas M. Stace, Göran Johansson, Phys. Rev. Letters 112, 093601 (2014). L20: “Giant Cross-Kerr Effect for Propagating Microwaves Induced by an Artificial atom”, Io-Chun Hoi, Anton F. Kockum, Tauno Palomaki**, Thomas M. Stace, Bixuan Fan, Lars Tornberg**, Sankar R. Sathyamoorthy, Göran Johansson, Per Delsing, C.M. Wilson, Phys. Rev. Letters 111, 053601 (2013). L19: ”The pumpistor: a linearized model of a flux-pumped dc-SQUID for use as a negative-resistance parametric amplifier”, K.M. Sundqvist**, S. Kintas, M. Simoen, P. Krantz, C.M. Wilson and P. Delsing, Applied Physics Letters 103, 102603 (2013). L18: “Breakdown of the cross-Kerr scheme for Photon Counting”, Bixuan Fan, Anton F. Kockum, Joshua Combes**, Göran Johansson, Io-Chun Hoi, C.M. Wilson, Per Delsing, G.J. Milburn, Thomas M. Stace, Phys. Rev. Letters 110, 053601 (2013). L17: “High Critical-Current Superconductor-InAs Nanowire-Superconductor Junctions” S. Abay, H.A. Nilsson, F. Wu**, H.Q. Xu**, C.M. Wilson and P. Delsing, NanoLetters 12, (2012). L16: “Generation of nonclassical microwave states using an artificial atom in 1D open space”, I-C Hoi, T. Palomaki**, G. Johansson, J. Lindkvist, P. Delsing, C.M. Wilson, Phys. Rev. Letters 108, 263601 (2012). L15: “Observation of the dynamical Casimir effect in a superconducting circuit”, C.M. Wilson, G. Johansson, A. Pourkabirian, M. Simoen, J.R. Johansson, F. Nori, & P. Delsing, Nature 479, 376 (2011). L14: “Demonstration of a Single-Photon Router in the Microwave Regime”, I-C Hoi, C.M. Wilson, G. Johansson, T. Palomaki, B. Peropadre, and P. Delsing, Phys. Rev. Letters 107, 073601 (2011). L13: “Are ‘pinholes’ the cause of excess current in superconducting tunnel junctions?”, T. Greibe**, M.P.V. Stenberg**, C.M. Wilson, T. Bauch, V. Shumeiko, and P. Delsing, Phys. Rev. Lett. 106, 097001 (2011). L12: “Photon generation in an electromagnetic cavity with a time-dependent boundary”, C.M. Wilson, T. Duty, M. Sandberg, F. Persson, V. Shumeiko, and P. Delsing, Phys. Rev. Letters 105 , 233907 (2010). L11: “Excess Dissipation in a Single-Electron Box: The Sisyphus Resistance”, F. Persson, C.M. Wilson, M. Sandberg, G. Johansson, and P. Delsing, Nano Letters 19, 953 (2010). L10: “Dynamical Casimir Effect in a Superconducting Coplanar Waveguide”, J.R. Johansson, G. Johansson, C.M. Wilson and Franco Nori, Physical Review Letters 103, 147003 (2009). L9: “Coherence Times of Dressed States of a Superconducting Qubit under Extreme Driving”, C.M. Wilson, T. Duty, F. Persson, M. Sandberg, G. Johansson, & P. Delsing, Phys. Rev. Lett. 98, 257003 (2007). L8: “Tuning the field in a microwave resonator faster than the photon lifetime”, M. Sandberg, C.M. Wilson, F. Persson, T. Bauch, V. Shumeiko, G. Johansson, T. Duty, and P. Delsing, Applied Physics Letters 92, 203501 (2008). L7: “A Radio Frequency Single-Electron Transistor Based on an InAs/InP Heterostructure Nanowire”, H.A. Nilsson, T. Duty**, S. Abay, C.M. Wilson**, J.B. Wagner, C. Thelander, P. Delsing and L. Samuelson, Nano Letters 8, pp. 872-875 (2008). L6: “Observation of Quantum Capacitance in the Cooper-Pair Transistor”, T. Duty**, G. Johansson, K. Bladh, D. Gunnarsson, C.M. Wilson, and P. Delsing, Physical Review Letters 95, 206807 (2005). L5: “Direct observation of dynamical bifurcation between two driven oscillation states of a Josephson junction”, I. Siddiqi**, R. Vijay, F. Pierre**, C.M. Wilson**, L. Frunzio**, M. Metcalfe, C. Rigetti, R.J. Schoelkopf, M. H. Devoret, D. Vion, and D. Esteve, Physical Review Letters 94, 027005 (2005). L4: “RF-Driven Josephson bifurcation amplifier for quantum measurements”, I. Siddiqi, R. Vijay, F. Pierre**, C.M. Wilson**, M. Metcalfe, C. Rigetti, L. Frunzio** & M.H. Devoret, Phys. Rev. Lett. 93, 207002 (2004). L3: “Time-resolved measurements of thermodynamic fluctuations of the particle number in a nondegenerate Fermi gas”, C.M. Wilson, L. Frunzio**, and D.E. Prober, Phys. Rev. Letters 87, 067004 (2001). L2: “Noise Mechanisms in Superconducting Tunnel Junction Detectors”, K. Segall, C.M. Wilson, L. Frunzio**, L. Li, S. Friedrich, M.C. Gaidis, D.E. Prober, A.E. Szymkowiak and S.H. Moseley, Applied Physics Letters 76, pp. 3998-4000 (2000). L1: “Experimental Quasiparticle Dynamics in a Superconducting, Imaging X-ray Spectrometer”, S. Friedrich, K. Segall, M.C. Gaidis, C.M. Wilson, D.E. Prober, A.E. Szymkowiak and S.H. Moseley, Applied Physics Letters 71, pp. 3901-3903 (1997). A22: “Generating Multimode Entangled Microwaves with a Superconducting Parametric Cavity”, CWS Chang, M Simoen, José Aumentado, Carlos Sabín, P Forn-Díaz*, AM Vadiraj, Fernando Quijandría*, G Johansson, I Fuentes, C.M. Wilson, Physical Review Applied 10, 044019 (2018). A21: “On-demand microwave generator of shaped single photons”, P. Forn-Díaz*, C.W. Warren, C.W.S. Chang, A.M. Vadiraj, C. M. Wilson, Physical Review Applied 8, 054015 (2017). A20: “Quantum heat engine with coupled superconducting resonators”, Ali U.C. Hardal, Nur Aslan, C. M. Wilson, Ozgur E. Mustecaplıoglu, Physical Review E 96, 062120 (2017). A19: “Dynamical Casimir effect in Circuit QED for Nonuniform Trajectories”, Paulina Corona-Ugalde, Eduardo Martin-Martinez, C.M. Wilson, Robert B. Mann, Physical Review A 93, 012519 (2016). A18: “Characterization of a multimode coplanar waveguide parametric amplifier”, M. Simoen, C.W.S. Chang, P. Krantz, J. Bylander, P. Delsing, C.M. Wilson, J. of Appl. Phys. 118, 154401 (2015). A17: “Direct observation of the thickness distribution of ultra thin AlOx barrier in Al/AlOx/Al Josephson junctions”, L.J. Zeng**, S. Nik, T. Greibe**, C.M. Wilson, P. Delsing, E. Olsson, J. of Phys. D: Appl. Phys. 48, 395308 (2015). A16: “Proposal for a coherent quantum memory for propagating microwave photons” M. Afzelius, N. Sangouard, G. Johansson, M.U. Staudt**, C.M. Wilson, New Journal of Physics 15, 065008 (2013). A15: “Nonclassical microwave radiation from the dynamical Casimir effect”, J.R. Johansson**, G. Johansson, C.M. Wilson, Per Delsing and Franco Nori, Physical Review A 87, 043804 (2013). A14: “Nanoscale interaction layer at the interface between Al films and SiO2 substrates of Al/AlOx/Al Josephson tunnel junctions” L.J. Zeng**, T. Greibe**, S. Nik, C.M. Wilson, P Delsing, and E Olsson, Journal of Applied Physics 113, 143905 (2013). A13: “Microwave quantum optics with an artificial atom in one-dimensional open space” I.C. Hoi, C.M. Wilson, G. Johansson, J. Lindkvist, B. Peropadre, T. Palomaki** and P. Delsing, New Journal of Physics 15, 025011 (2013). A12: “Scattering of coherent states on a single artificial atom”, B. Peropadre, J. Lindkvist, I.C. Hoi, C.M. Wilson, J.J. Garcia-Ripoll, P. Delsing, G. Johansson, New Journal of Physics 15, 035009 (2013). A11: “Coupling of an erbium spin ensemble to a superconducting resonator” Matthias U Staudt**, Io-Chun Hoi, Philip Krantz, Martin Sandberg**, Michaël Simoen, Pavel Bushev, Nicolas Sangouard, Mikael Afzelius, Vitaly S Shumeiko, Göran Johansson, Per Delsing, C.M. Wilson, Journal of Physics B 45, 124019 (2012). A10: “Approaching perfect microwave photodetection in circuit QED”, Borja Peropadre, G. Romero**, Göran Johansson, C.M. Wilson, Enrique Solano, Juan José García-Ripoll, Physical Review A 84, 063834 (2011). A9: “Ultralow-power spectroscopy of a rare-earth spin ensemble using a superconducting resonator”, P. Bushev**, A. Feofanov**, H. Rotzinger, I. Protopopov, J.H. Cole, C.M. Wilson, G. Fischer, A. Lukashenko, A. Ustinov, Physical Review B 84, 060501 (2011). A8: “Fast readout of a single Cooper-pair box using its quantum capacitance”, F. Persson, C.M. Wilson, M. Sandberg and P. Delsing, Physical Review B 82, 134533 (2010). A7: “Dynamical Casimir effect in superconducting microwave circuits”, J.R. Johansson, G. Johansson, C.M. Wilson and Franco Nori, Physical Review A 82, 052509 (2010). A6: “Dressed relaxation and dephasing in a strongly driven two-level system”, C.M. Wilson, G. Johansson, T. Duty, F. Persson, M. Sandberg and P. Delsing, Physical Review B 81, 024520 (2010). A5: “Fast quantum limited readout of a superconducting qubit using a slow oscillator,” Göran Johansson, Lars Tornberg, C.M. Wilson, Physical Review B 74, 100504 (R) (2006). A4: “Quasiparticle number fluctuations in superconductors”, C.M. Wilson and D.E. Prober, Physical Review B 69, 094524 (2004). A3: “Dynamics and energy distribution of nonequilibrium quasiparticles in superconducting tunnel junctions”, K. Segall, C.M. Wilson, L. Li, L. Frunzio**, S. Friedrich, M.C. Gaidis, D.E. Prober, Physical Review B 70, 214520 (2004). A2: “Quasiparticle nonequilibrium dynamics in a superconducting Ta film”, L. Li, L. Frunzio**, C.M. Wilson and D.E. Prober, Journal of Applied Physics 93, pp. 1137-1141 (2003). A1: “Improved energy resolution of X-ray single photon imaging spectrometers using superconducting tunnel junctions”, L. Li, L. Frunzio, C.M. Wilson, D.E. Prober, A.E. Szymkowiak and S.H. Moseley, Journal of Applied Physics 90, pp. 3645-3647 (2001 ).